New BlackBerry Keyboard Patenet Application | BlackBerry Blast! RIM has applied for several BlackBerry patents in the past so this is no surprise. 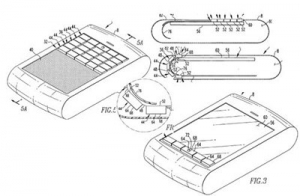 RIM has applied for a patent for a reconfigurable keyboard. This one looks interesting. As you can see in the picture the keys are set in a scrollable layout. If you only need a few keys you can configure your keyboard to show you only the needed keys. Check out the full story link for more information.